Interview with Xaris Beladakis on GreekRebels.gr — Oh. What an epic interview you will be reading below with Xaris Beledakis, from the Greek rock and metal website Greek Rebels! Art is not what you listen to, but also what you feel. Music as art has nothing to do with melodies and notes. The purpose of the music is to awaken emotions and finally to define what person you want to be. Olivia Hadjiioannou seems to be the winner of this view. Her true talent and excellent music training coupled with her young age promises a brilliant future. In the context of the Metallia release, she devoted a little of her time to me for a highly musical discussion. Hi Olivia! I’m Harris from Greekrebels.gr. At what stage do I get you? 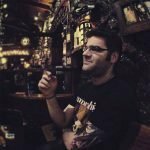 It’s great to meet you Xaris and thank you for listening to “Metallia” and for the review and this opportunity to talk to you and your readers on Greekrebels. First of all, I would like to congratulate you on your new album, “Metallia”. What are your first feelings now that you hear it complete? Thank you Xaris! My feelings about “Metallia” are the same as when I wrote it – a moment of living in the present. The present of “Metallia” – that brings you into her reality. Would you change something in this or do you think it sounds exactly the way you wanted it? I would not change anything, no. As I said before, her world is built. How did the whole story begin with this project? “Metallia” is a concept album and is the second part of a trilogy that started with “Synemotion”. The album “Metallia” has to do with the arrival of our primal state or understanding. The realization of what we are and what our place is in this reality. “Synemotion” was for emotions, while “Metallia” is for the mind. What are the first comments you have received by the press and the internet so far? The album has received over 25 reviews in 13 countries such as Germany, France, United Kingdom, America, the Netherlands, Russia, Australia, Canada and Italy. The response is amazing and some of the tracks are even played on FM radio stations in many different places abroad. Just give me some basic information about “Metallia”. Where did the recordings take place? How long did they last? Everything is done in my home studio. This is where the whole production is written and completed. Production started in 2017, except for the four singles. The ballads, “I’m In Love,” “Love of Avalanches,” “Love Will Heal,” and “Deserted Eyes,” and the videos I took during that time took me a total of about five to six months to finish the six pieces of “Metallia”. Its total duration is more than 25 minutes. Would you feature it as EP, full-length or mini-album? Do you think it was enough time to express yourself as you wanted? Some feature it as EP and some as a mini album – although the EP concept is the way to describe a mini album. Otherwise we are talking about single where it can be from one to three tracks with a maximum of 30 minutes with the iTunes data. Based on Official Chart Company data, an EP includes the minimum of four pieces, with a maximum of up to six pieces. The limit is set to a maximum of 25 minutes or four pieces. A LP was usually 33 minutes and 45 minutes, because that is how much music could be engraved on a vinyl. Now in the digital age it is meant that some things have changed. Metallia lasts 25:22 minutes. You can place it where you want according to industry standards, but the concept is complete. Although I expected Metallia to be purely progressive, I think it’s not just that. Inside I have found many references to industrial, electrowave, even avant-garde influences. Would you consider it experimental or simply varied? For me it is just music, but if we need to clarify genres and influences, first what is “purely progressive” – do you mean imitating the progressive rock of the 70’s? Then no. But take into account the prog rock of the 70s was taking their present-day rock music and pushing its limits. ‘Progressive’ in any genre whether jazz, electronic, rock or metal generally means it explores the genres outer boundaries while maintaining elements of that genre and possibly even introducing elements from other genres in the mix. As an instrumental record, would you say that it is more targeted at musicians or is it easy for the wider audience? I’m asking why songs like “Dragon’s Kiss” may sound complex for an ear that does not have the necessary technical training. At first, “Metallia” can be heard as something different, chaotic and complicated, but other than others have said to me, whether they are musicians or the wider audience, after some listening they tell me it grows on them. If the listener decides and continues to listen to Metallia’s differentness and unusual sound and goes to the next stage, he will reveal the different strata where they will recognize familiar elements. Music is a global language. You do not have to be a musician to understand it. Does “Metallia” follow a certain concept, or are all pieces structured with a “beginning-middle-end” system? There are six songs, Red Lion (prima materia), Bee (nigredo), Androgyny (albedo), Resurrection (rubedo) , Dragon’s Kiss (citrinitas) and Triumph (Lapis Philosophorum), that relate to some of the processes in alchemy which is part of the wisdom of the universe. Metallia focuses on alchemy but not in the sense of changing physical lead into physical gold but as an investigation into what is our true spiritual constitution through experiencing the mysteries of birth, mind, duality, death and resurrection. So, though each track has a ” beginning-middle-end “, all the tracks are one journey. The first impression that the album left me is that it wants to combine the progressive atmosphere with modern production that gives the album an almost industrial sound. What exactly is the climate you wanted to achieve? My goal was not to engage the progressive atmosphere with an almost industrial sound. In general, my goal is not to engage species and sound. My goal is to convey the concept, using the sound/production capability to showcase the method of this concept. As I wrote in my review, the orchestrations gave my ears a cinematic air. I do not hide from you, when closing my eyes, I thought it was a soundtrack of a science fiction film played in a dystopian future. Would you say that Metallia has been influenced by movies? I love the idea of writing music for film and I know that my music shows such intentions, but “Metallia” has not been influenced by films. No, it’s inspired by thoughts that concern us as people. I know that you have everything in the disk, from instruments to production, mixing, mastering. How easy or difficult is this? How do you work in the studio? It has its beauties and difficulties. It’s beautiful because you portray what you have in mind, but it’s difficult because you do it all yourself. Because abroad such a job would take of up to at least 10 people, maybe more. Without the musicians. It is reasonable. How do I work in the studio? I make coffee, close the door, open channels, plug in the instruments and microphones and start recording. Have you ever felt you need help? Yes, many times I have hoped to have “Thing” from The Addams Family movies. Have you ever thought of Oh. to become a full band in the future or is it your own dream? My primary goal was not to do all by myself. We (and other musicians) formed a band just before I released my first EP “Sleeping World” as voice and a second guitar, but the circumstances were such that just did not happen. Our interests were different, and everyone went their own way. Being a band in the future is not something that draws me, but to work with producers and artists, yes. Tell us a few words about the admirably wonderful cover. Who did it? The artwork of the album is a collage of elements from various European master artists. The archangel on the cover was inspired by a famous painting by Jan Van Eyck. The inside of the album and the pictures of the booklet for each piece were the result of research over 6 months, looking for ancient alchemy and correspondingly internal and academic references. Texts and images that reflect the meaning and meaning of “Metallia”. Initially, I made a draft of their placement on photoshop and created a mockup. I worked closely with a family member who is a graphic designer/developer for the final comps. You can see the whole process in the next video titled “The Making of Metallia” that has been released since October 29th. Really, what guides you when you create music? The technique or the feeling? Neither. The concept guides me. Metallia is self-financed. Was this choice conscious? Did you contact a label initially? In 2013, with my first Sleeping World release, I approached three companies, but for many different reasons, and after much thought I made the decision to continue independently for the time being. It requires a lot of hard work to run independently. When you have spent a year recording, you think that after all this hard work is over. But this is half the story. There is so much more to do about marketing and distribution. But, now after two albums and 4 singles, you learn the process. It is more a matter of time and effort than finances. All my releases are self-financed, but except for the hours put in, it is relatively inexpensive to distribute your music on places like TuneCore. You just need to spend time doing a lot of legwork and building a fan base. As for the financing of the CD. For a couple years, I have a profile on a site called Patreon. It is a type of crowd=funding platform but unlike others like Kickstarter or PledgeMusic, it is a place where people can support you on a monthly basis or per project. I initially started it, so I could finance a new computer, as my 8-year-old Mac was burning out. In two years, I collected a few thousand dollars for that goal but never reached the amount for a Mac.Six months before Metallia was finished, a friend from New York sent me their used three-year-old Mac, so the money from Patreon could be used to finance the printing of the CD. I have worked with one of the few Greek CD printing companies that have been left (BS added “keep it local”) and with a Greek T-shirts printing center in Exarchia. You can see making of T-shirts here. So, what are the future plans for Oh? Do you have any material for some possible next release? Yes, there are two albums in production now. The third installment in the trilogy of Synemotion and Metallia and a new album that is more like my first album, called “Prog Unshaven”. Two last questions. First. What are, in your opinion, the major differences between a voice-interpreted disc with a fully instrumental? In an instrumental album there are nether lyrics nor focus on a vocalist. If there is no main vocalist your attention is drawn more to the music and if there are no lyrics, you can make your own narrative as you travel on the musical journey. There were many people who wrote me and told me what their favorite song on the album was. And after talking for a while on a more personal level and discussing what they were going through at the moment. It was obvious that the particular song they preferred was pretty music the situation they were in. Now this happens with non-instrumental music because of the lyrics and emotional sentiment, but for it to happen with an instrumental album is very interesting. Second. Lately I have noticed a particular preference for younger musicians like you to start with entirely musical chores. What is the significance of an instrumental disc? I mean, what makes it special? As for the younger generation of full-time musicians, it is probably because the internet now supports and make it easier for people to distribute their works. Some statistics say there are over 20,000 albums being released a month just from bigger labels and not including independents. So, you can imagine how much music is coming out every day. Places like YouTube and Soundcloud and distributors like TuneCore make it possible for any artist to release music and full works as you mention. Of course, it doesn’t mean anyone will listen to it. Olivia, I will not bother you anymore! Thank you very much for the time you gave me! The last words are yours. Music can be more than entertainment, background music, which resonates only in our known emotional states or as a means of sparing, or as the satisfaction that is raised by finding related sources with people of the same reasoning. Frequencies in a composition can be adjusted in such a way as to convey a person to a physical, emotional and spiritual level. I believe that the artist practices the language of music. Music. As the word says. “Art of the Muse”. And a Muses’ work is to find and connect with this “superior” than what we can perceive and to transfer it to the world without interfering or imposing the artist’s feelings on the listener. An artist can compose music that transforms someone, motivates them, and excites the listener to discover more about himself. And “Metallia” is written it in this spirit and with this hope. With the prospect of listeners participating in all this journey.